PARADISE, Calif. (AP) — As relatives desperately searched shelters for missing loved ones on Sunday, crews searching the smoking ruins of Paradise and outlying areas found six more bodies, raising the death toll to 29, matching the deadliest wildfire in California history. Wildfires continued to rage on both ends of the state, with gusty winds expected overnight which will challenge firefighters. The statewide death toll stood at 31. 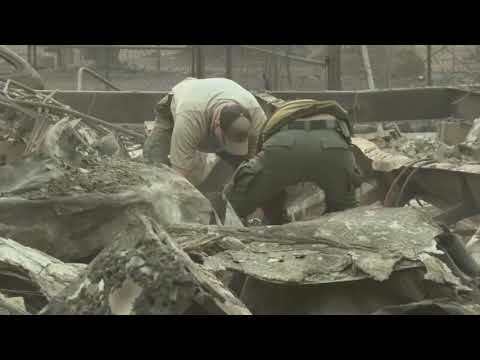 The Camp Fire that ravaged a swath of Northern California was the deadliest. Ten search and recovery teams were working in Paradise — a town of 27,000 that was largely incinerated on Thursday — and in surrounding communities. Authorities called in a mobile DNA lab and anthropologists to help identify victims of the most destructive wildfire in California history. Firefighters battling the Camp Fire with shovels and bulldozers, flame retardants and hoses expected wind gusts up to 40 mph (64 kph) overnight Sunday. Officials said they expect the wind to die down by midday Monday, but there was still no rain in sight. More than 8,000 firefighters in all battled three large wildfires burning across nearly 400 square miles (1,040 square kilometers) in Northern and Southern California, with out-of-state crews arriving. Two people were found dead in Southern California , where flames tore through Malibu mansions and working-class Los Angeles suburbs. The burned bodies were discovered in a driveway in Malibu, where residents forced from their homes included Lady Gaga, Kim Kardashian West and Martin Sheen. Actor Gerard Butler said on Instagram that his Malibu home was “half-gone,” and a publicist for Camille Grammer Meyer said the “Real Housewives of Beverly Hills” star lost her home in the seaside enclave. In Northern California, Sheriff Honea said the devastation was so complete in some neighborhoods that “it’s very difficult to determine whether or not there may be human remains there. Authorities were also bringing in a DNA lab and said officials would reach out to relatives who had registered their missing loved ones to aid in identifying the dead after the blaze destroyed more than 6,700 buildings, nearly all of them homes. The 29 dead in Northern California matched the deadliest single fire on record, a 1933 blaze in Griffith Park in Los Angeles, though a series of wildfires in Northern California wine country last fall killed 44 people and destroyed more than 5,000 homes. About 150,000 people statewide were under evacuation orders, most of them in Southern California, where nearly 180 structures were destroyed, including a large mobile home community in rugged Santa Monica Mountains north of Malibu. “Things are not the way they were 10 years ago. ... The rate of spread is exponentially more than it used to be,” said Ventura County Fire Chief Mark Lorenzen, urging residents to evacuate rather than stay behind to try to defend their homes. Selsky reported from Salem, Oregon. Associated Press writers Janie Har and Daisy Nguyen in San Francisco; Don Thompson and Martha Mendoza in Chico, California; Christopher Weber in Malibu, California; and Andrew Dalton and John Antczak in Los Angeles contributed to this story.